I forgot the UzeBox the first time i saw it … NTSC … and the rest of the world! wow. Don’t they have dual standard TVs where ever you are? And I thought Australia where I am was backwards, but we have had TVs that did PAL and NTSC for at least 20 years. lol well it’s a mixed batch here some TV’s do have PAL and NTSC and some don’t. But in any case who wants to look at a crappy looking NTSC image? But PAL is so boring! WIth NTSC you have never twice the same color! Possibly the same people that want to look at a video game about a yellow disc with a mouth being chased by ghosts. Maybe the same people that write filters for NES emulators so they can have scanlines and dot-crawl on their 2700×1440 pixel s-ips LCD screens. Maybe the people that just want to have the fun that is the challenge of writing a video game on the same processor as in an Auduino but has not video generation hardware. You know the fun of being creative. I do all of these thing *without* NTSC. I do have one old retro computer that I use a PAL baseband modulator for but everything else id some form of VGA. Even this is going to be converted to VGA. Baseband modulation, weather it be NTSC or PAL is good for monochrome only. They have issues with color as the dot clock is to close to the color burst frequency for the resolution of computer displays. In any case PAL is far superior to NTSC. Pal is *usable* for color baseband, NTSC is trash. Awesome. As long as you are creating and not just being an apex consumer. What kind of retro games are you writing. Have you got examples on the interwebs to show off. My old project folder is here – https://hackaday.io/projects/hacker/12113 and it will show the sort of things that I do. I’m still dealing with hardware on my projects so I am not writing stuff for them at this stage. I don’t bother updating the HAD.io as I got sick of the image editing for the 1000 ever-changing aspect ratios. Talk about a messy setup. Ripe for a custom PCB. between the due and any 328p based arduino, performance on these serial displays are night and day. i was scanning out a 3 frames a second on the latter. the same demo on the due (though to be fair with a different graphics library that used dma) was a blur. I remember playing the official port of PacMan on my old Franklin Ace 1000 back in the day. Definitely 8 bit, and just a hair over 1MHz. Yes, it had a separate chip chucking bits at the display for it, but I also played the Atari 2600 port and that machine was very much lime today’s microcontroller video hack. The original game was 3MHz and 4 cycles per instruction – about 0.75 MIPs. The ATmega328 is about 20 MIPs so in theory this game should run on the 328. I don’t think it’s a *fair* test because this is probably only just out of reach for the 328 if you are using sketch. You could probably do it with C and you could definitely do it with ASM if there was a cross assembler. I agree. 328p should be able do it with a good sprite GPU . This would make a fun competition. Didn’t those old arcade cabinets have huge circuit boards filled with other parts to generate video, audio, and otherwise assist the slow CPU? Yes they did.That’s why you can’t compare them purely based on the CPU. The boards where huge because the common garden variety chips only had 4 gates in them (by average) so it took lots an lots of them even to do simple things. Generating video was the most complex task and a big proportion of the chips were for that. With a 20 MIPs chip you should be able to bit bang the video and still have enough MIPs left to run a 0.75 MIP program with ASM and C or a cross assembler but it would still be a lot of work to port it over. Not sure if saying nah or telling how? OK, If a start with PAL cos I know PAL and it would be close enough. The lines are 64uS wide including sync. Of that about 60uS (or less) is active screen area. The screen was vertical so the 60uS has to fit the larger pixels – 288 and that gives us a dot clock of about 4.8MHz. 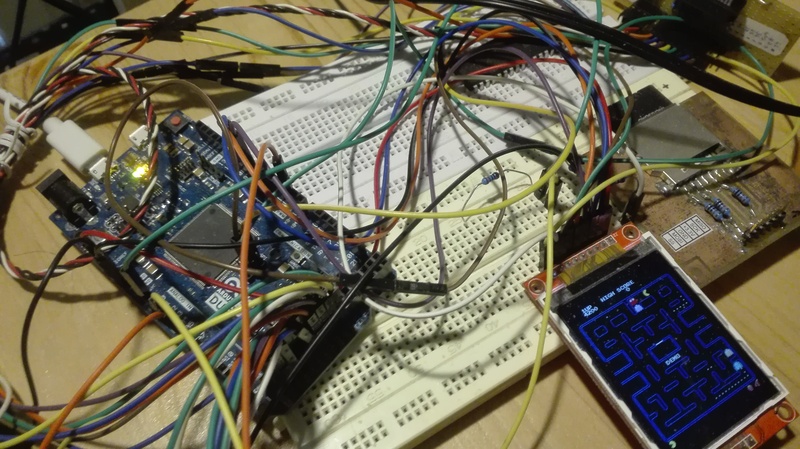 There is noting to say that we can’t use other (external) chips so add in 4 of Parallel Input Serial Output Shift Registers to take advantage of the fact that the Micro-controller has an 8 bit data width and everything on the screen is arranged onto 8 bit units. Now we have a 4 register loads at 600KHz and that is much easier to do with a regular interrupt without wasting so much set up time. We could even add a big SRAM chip so that the micro just does the timing. There are other alternatives as well. We could use a VGA screen that has a lower resolution and dot clock. Generally you can use an *actual* dot clock that is half or quarter of the specified dot clock for a particular standard. Video generation is a fairly *dumb* process that can be given to *dumb* parts that work fast. The timing then can be handled a lot easier my the *smart* component. The Gameduino or Gameduino 2 shields do precisely that. The original Gameduino uses an FPGA to generate video and audio. The V2 uses an embedded video processor. The point about the Duo is that it has enough grunt to do without external assistance. I bought a GameDuino (1) over a year ago and still haven’t used it. The main ‘cheat sheet’ is larger than normal printer paper and an American paper size so I can’t print it with a normal printer and I cant take it to a print house because of the paper size. The ‘cheat sheet’ is available on their website but they only post to America. I even tried to fit it onto several normal pages but the PDF that it is in wont let me do that. Yet another project completely destroyed by poor documentation or if you *NOT* American – missing documentation. On hackaday.io there is also an improved version of [Mike Szczys]’s 1-Pixel Pacman, This runs on an arduino uno with a Seeed studio LCD screen. Touching the edges of the screen turns pac-man. Features such as high score initials capture and display as well as pause to restart were added. Instead of a custom controller, how about a NES controller plus a 74595 to decode the serial data back into 8 button parallel data. Or better yet, add NES library and you’d need just a few lines rather than 8 lines for controller. You can use SPI to read it (via MISO pin) to read it without extra hardware. Pacman on ATMega 168 (less powerful than Arduino Uno). Implemented on the AVGA library that can output video to VGA and Composite PAL/NTSC.